Summer is upon us, which means school is out, beach/pool time is here, and there is just more going on in our lives, regardless of our age. Please don't neglect your practice schedule during summer. I know it's hard to find time for some of you, but it's important to keep on practicing, and not let a few weeks of non-playing slip in. So with that out of the way, let's have a look at the lessons you guys watched most in the month of June. It looks like this month was the month of the Beatles for some reason, 2 of this icon band's songs made it into the top 5 list. Interesting, since Beatles songs are usually not in the top 5. Is their music making a comeback? Anyhow, Hey Jude is a popular song, the version you'll learn on TheGuitarLesson.com consists of a lot of barre chords, making it ideal for you if you are working on perfecting your barre chords. 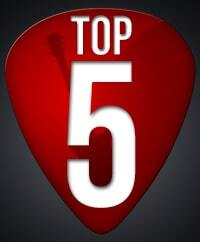 If you follow this series of posts, it should come as no surprise that the Spanish guitar lesson is among the top 5 contenders once again. If you haven't learned this song yet, don't wait any longer. There is a reason why this is one of he most popular lessons on the site month after month. It sounds great, but is actually really easy to play and master. Wipe Out is definitely one of the most popular lesson on the site, since it's a really good plucking song beginners can start practicing almost from day 1. You will get a chance to work on your speed and alternate plucking technique, which is an important skill for guitarists of all level, regardless of whether you prefer the electric or acoustic guitar. Of course, this song will sound better amplified, using an electric guitar, but don't let that hold you back if you only have an acoustic at home. Stand By Me is another really useful song if you are working on your barre chords. Again, this is one of the most popular songs on the site, it is one of my top recommendations for advancing your barre chord techniques. You'll also learn a versatile chord progression, which you'll be able to use to create your own music as well, by transposing the chords. I have to admit, Let It Be is one my favorite songs of all time. I would say I doodle it at least once a week. It has a great chord progression suitable for beginners (no barre chords), and is loads of fun to play along with the original. It also has a solo, which I did not teach in this lesson, but I think I will create a video on the solo as well, since it is such an integral part of the song, and it's great for learning improvisation. So watch out for that lesson sometime in the future.